Holiday.gr - Asklipios, a trip to a myth! Village of south Rhodes which – although it has no tourist development – is worth visiting and meet the other face of Rhodes. Simple, hospitable people who are glad to talk about their place, without aiming to a personal profit, but do it from love towards this beautiful island that gave birth to them. These are the residents of village Asklipios. 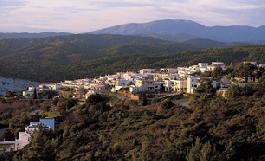 Of this traditional village with white houses and a beautiful view towards the sea. There is an ecclesiastic and folkloric museum in the village, while worth visiting is the church of Dormation.